The Women's Christian Temperance Union played a key part during the temperance movement, leading to the installation of temperance laws and education as well as sending a clear message to the Americans about their opinions regarding alcohol. 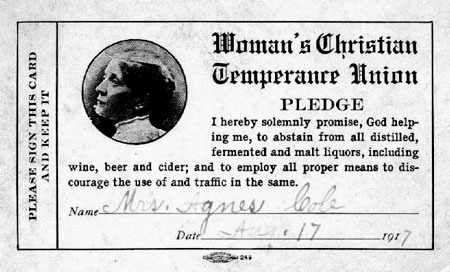 The Women's Christian Temperance movement (WCTU), first organized in 1874, was at the forefront of the impact that temperance societies would have on the upcoming Prohibition Era. One of the first politically charged campaigns was the installation of clean drinking water fountains in busy cities. Over several years, many fountains were installed throughout several cities. This was particularly helpful to the temperance movement because it gave people a free, alternate, and easily accessible option to alcoholic beverages. When the new leader of the organization Francis Willard took over, the organization gained steam. Children became a large part of this fresh Temperance movement and they joined Loyal Temperance Movements where parades were conducted in the streets. A new movement was also started in the public education system. Temperance textbooks began to be widely distributed around the the country. This movement was generally successful as by 1885 Congress mandated temperance education in the public school system and by 1901 all states in America has temperance laws in practice, helped along by the work of Mary Hunt. The Women's Christian Temperance Movement continued on and accomplished having a permanent professional lobbyist in the nation's capital. The WCTU defined temperance as "moderation in all things healthful; total abstinence from all things harmful," as first said by the Greek philosopher Xenophon. Because they considered alcohol harmful, they pushed their members to abstain completely from alcoholic beverages and asked them to sign a pledge (shown below). The WCTU also worked to convert immigrants into America into "dry" citizens, meaning that they two would abstain from alcohol. Much of the WCTU's budget was spent on Ellis Island in order to achieve this goal. Other goals of the Women's Christian Temperance Union focuses more on the places where alcohol were sold. Some members of the WCTU would go to saloons and ask their owners to close them; other members tried more direct and effective actions. They picketed the saloons and blocked the doors of the liquor-selling buildings. Though these actions affected many of the people more prone to drink, their most important actions that influenced prohibition was their work with the immigrants. Their work meant that most of the immigrants who would become Americans were prohibitionist, therefore leading to a steadily increasing number of prohibition supporters. But cider--no cider for us, if you please. But we'll turn town out glasses where pours the red wine. But when made into beer it is poison instead. When men change them to poisons, we'll bravely say, "No." Members of Women's Christian Temperance Movement campaign for an amendment creating national prohibition. An example of common pledge that members would take promising complete abstinence from alcoholic beverages.